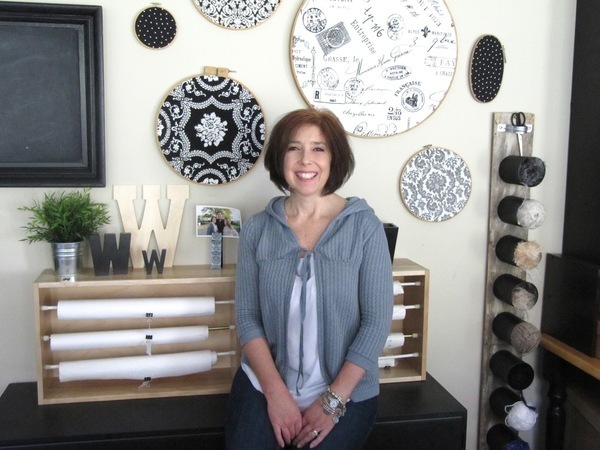 We head to Westerly, Rhode Island to explore the chic black & white sewing room of Karen from Sew Many Ways. "My favorite thing about my sewing-craft room is the natural light from all the windows. My sewing room has been in so many different places in our home over years, like the basement and small closets, so the windows really make all the difference for me." We live in Westerly, Rhode Island and have been here for over 26 years. My sewing-craft room was a three season porch at the back of our home. It is located right off the family room, so I am still close to all the action that goes on in the house! The room is 12 feet by 25 feet with a full long wall of just windows. The room is all mine for sewing, crafting and my office and blogging work. However, I always have comfy chairs in there for my family to come in, sit for a while and visit. My sewing/craft room is where I do everything from quilting, sewing, painting, gluing, creating etc. You name it...if I do it...I do it in my craft room! I have the room broken down into areas. I have a crafting area, sewing, fabric cutting, gluing station, office area etc. This makes for better organization and less stress while trying to work and find things. I think paint is the most important thing in my workspace. I have painted old pieces of furniture all the same color black. It helps to unify all the pieces, but it's also a great backdrop for all the things that I make in my space. Organizing is my main hobby. I love it so much, I wish I could make a living at it! I organize and label everything in my craft space and the whole house too...everything! If things are organized and have a "place", there is less stress and more time to create, because you're not spending valuable minutes searching for things. Having things organized makes it easier for me and the whole family. I have used so many things to keep things neat and tidy. I've used galvanized buckets, plastic shoe boxes, cardboard boxes covered with fabric, painted coffee cans and wire baskets. Look past the obvious storage solutions that you can buy in the store and try to recycle things you already have. I little paint or fabric can unify anything and make your space sing. My favorite possessions are little things that no one would even look twice at. They are my mom's sewing tools...her thimble, a little wooden tracing wheel and a pincushion. Special memories of her that I wouldn't trade for anything. I do have a few quilts on display that were my first creations years ago. The first quilt I ever made was for my husband and the first quilt I hand quilted was for my mom. Inspiration is everywhere, but I do keep them in 2 places. I tear out magazines pages and store them in plastic protector sheets in a three ring binder organized by category and of course who could live without Pinterest!! I look for inspiration everywhere, but for me what inspires me to create something or come up with new ideas is the "need" for it. What I mean by that is, finding the solution to a problem is what makes me think beyond the norm to find the answer. As the famous quote goes, "necessity is the mother of invention". 1. Heat. I know that sounds crazy, but my room is a three season porch and there was never a heat source added to that room. I have to use a space heater in the winter!! 2. More pot lights in the ceiling. Although I have great natural light during the day, I wish I had a few more lights in the ceiling for when I work at night. I absolutely love this room. And I could tell while reading this post, that we think a lot alike. I label everything. I like things to be organized and I love to organize. My house is old, so it has no insulation so I have to bring in a space heater to heat my room in the winter. I have only one overhead light, and it's so dark in the winter, but the big windows do help. Right now I'm in a small room (which is suppose to be our living room), but while the house is still undergoing remodeling improvements, that is where I have to be. It's a small room, only about 9 by 9. I use to have a double car carport with additional room attached that I enclosed for a large work studio at my old place. I sure do miss it. I love your idea of painting all the furniture to match. I'm working on that now, finding old furniture pcs. and sanding them down to paint. I love clear storage containers, as I'm very visual. I really like to be able to just look up and see my fabric colors. Great great article and thanks so much for sharing.